This is the best whisk broom you'll ever use and the last one you'll ever have to buy for yourself, although you may want to send one to a friend!! 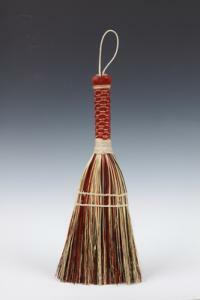 Celebrating our Appalachian heritage, this broom is a testament to simple and elegant grace. The warm colors of rust, black and natural broomcorn and decorative braid will compliment any decor. size: 13" x 6" x 1"